So I am finally down to the last item that I put in the favor bags order (I hope all these posts weren't boring and stretched all this time :)). I had to hold this project till the end as I had used some soon to be released PPRS stamps on these and I didn't want to spoil the fun of the PPRS Release Party which will happen in the span of 3 days(11-13 May) later. Since I have the project posted as a sneak peak on the PPRS blog today, I thought I will share it here too. 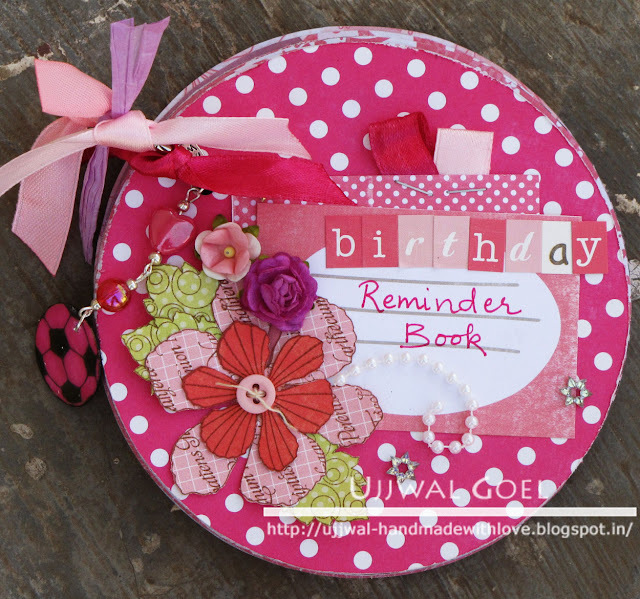 I made 3 birthday reminder books to be put into the girl's(aged 9, 12, 15) favor bag. Do you remember the first one I made? She was pretty busy that time but still jumped in to help me out and I love those charms she made. She even color coordinated them for me. How awesome! Thanks a ton sweetie!! 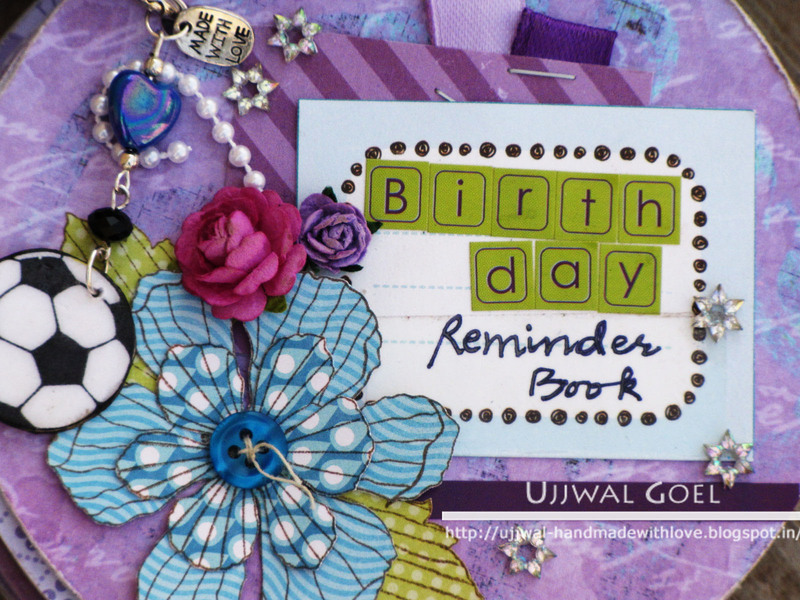 If you have any questions or would like to place an order for anything you see and like on my blog or if you have any other custom order request, please feel free to e-mail me at ujjwal.handmadewithlove@gmail.com and I will happy to help. I hope you like it! Thanks for visiting and being so appreciative of my work always. These birthday reminder books are so gorgeous ujjwal...i love the way you have decorated it in the front...would have loved to have a sneak peek of the insides..this could make any little girl happy!!! These are super cool...Very apt for girls and very thoughtful too.Only you can come up with something gorgeous like this. i love CD minis!! they are super fun! i loved how u decorated these!!! WOW! These are impressive and they look great! How do you do this.. I have been looking at CDs and patterned papers for more than 5 yrs.. never thought of something like this.... U r a Genius! These are fantastic!!! love the color selections!! FAAAAABULOUS if i may say so! Cardboard Mini Albums on order! PPRS Release Party Blog Hop!! 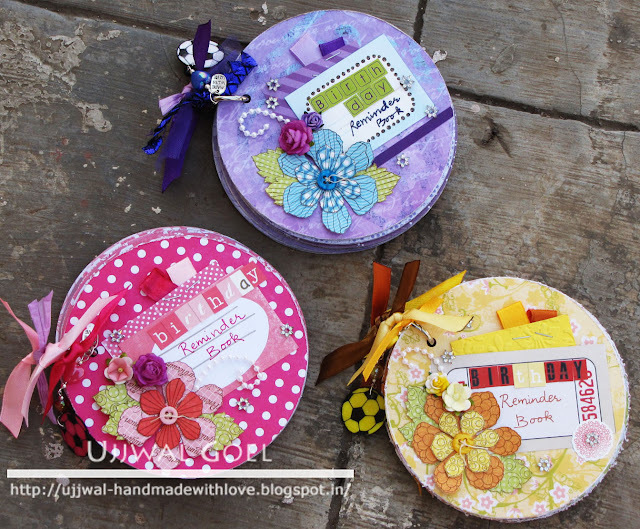 Recycled Flowers + Giveaway Winner!